US 11 and VA 10 from the Tennessee line to Abingdon. 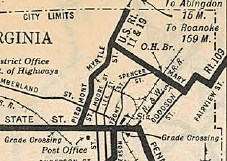 Initially, US 19 entered Virginia via Pennsylvania Ave int Bristol, TN, then used State St west to Front St north to Spencer St northeast to Mary St east to Goodson St north to Danville Ave east to Fairview St north to Massachussetts Av east to Texas Av north which becomes Old Abingdon Hwy. which runs back into US 11-19 near the I-81 interchange. Leaving Hansonville, US 19 used today's 19 up to SR 674, then abandoned alignment on the north side to Sunset Dr; US 19; SR 841 (except initially used SR 758 loop) to US 19 Bus; tiny bit of 19 Bus; Gilbert St/Old Fincastle Rd; VA 82; US 19 Bus through Lebanon. East of Lebanon, US 19 used SR 656 loop back to 19. After a brief stretch of today's US 19, US 19 followed the SR 872 loop near VA 80 EB. US 19 followed more of today's 19 but near VA 80 WB stayed north of the creek on Old Rosedale Hwy and some abandoned alignments until around SR 644. East of here, US 19 more closely followed it current path although in the field it appears old alignment pieces are visibe to the north side. Before VA 369, US 19 originally used SR 770 to cross into Tazewell County, then SR 609 north back to US 19. US 19 followed its current path to Claypool Hill except it used the SR 705 loop. At Pounding Mill, US 19 used SR 637 but otherwise followed US 19-460 and then Bus US 19-460 to VA 16 ALT. Initially, US 19 followed Old Fincastle Tpk in western Tazewell, then current US 19 Bus through Tazewell, tehn Ben Bolt Rd east to VA 61. US 19 then followed VA 61 north to SR 678 Market St. US 19 followed SR 678 north to SR 645 east which used to connect back to modern 19-460. In Feb 1930 (CTB), US 19 was rerouted to remain on Piedmont Ave north to Euclid, then northeast out of town. Mary St/Goodson St/Danville Ave/Fairview St/Massachusetts Ave became part of an extended VA 109. but Texas Ave and Old Abingdon Hwy became SR 645 (now all within the City of Bristol and unnumbered now). About 1934 (bridge date), US 19 was removed from the Old Rosedale Hwy alignments. In July 1937 (CTB), US 19 was removed from Colonial Ave in western Abingdon and placed on current US 11. In Feb 1938 (CTB), US 19 was placed on its US 19-460 Bus routing through all parts of the town of Tazewell. In Oct 1938 (CTB), US 19 was removed from the SR 680 loops in Springville. In Jan 1940 (CTB), US 19 was removed from Greever/East St in Bluefield. In Apr 1940 (CTB), US 19 was placed on modern US 19 Business in Lebanon. A little bit of the old routing in Lebanon became VA 64 but is all unnumbered today save a speck of VA 82. US 19 was also removed from SR 656 east of Lebanon. 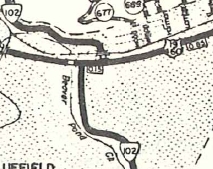 In Aug 1951 (CTB), it appears US 19 was moved to its current Abingdon Bypass, replacing US 19 ALT. The old route through Abingdon remained parts of US 11 and US 58 ALT. SB used Piedmont, then Cumberland east to Lee, then south along 5th and Lee to Anderson, then south on Anderson. In Aug 1955 (CTB), US 19-58 ALT was removed from all the SR loops between Abingdon and Hansonville. 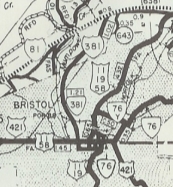 In Dec 1966 (CTB), US 19 was rerouted in Bristol to its current routing. 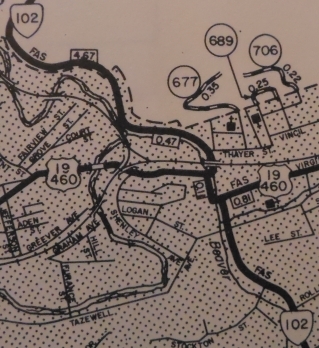 Between 1962-75, US 19 was rerouted in Bluefield to a less direct route across Bluefield. It left Graham Ave at Walnut, then south to what is now Virginia Ave then east back out of town. Originally it had used Graham Ave all the way through. 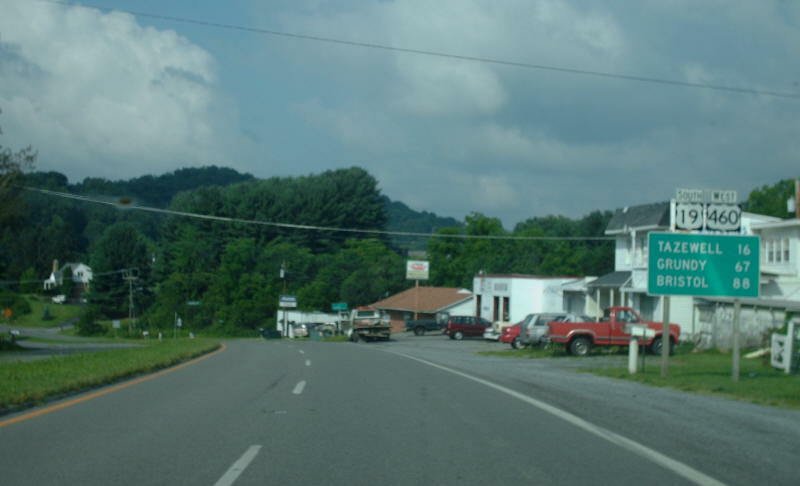 In 1974, US 19 was put on its bypass of Tazewell, leaving behind US 19-460 Bus. In March 1976 (CTB), US 19 was removed from SR 841 south of Lebanon. In 1985, US 19 was placed on its bypass to the south of Lebanon (first mentioned in the May 1970 CTB for approving its path), leaving behind US 19 Business. Improvements: Upon designation in 1927, US 19 was paved everywhere except from Hansonville to Lebanon. The First segment of US 19 to be multilaned was in the Holston area, in 1965. 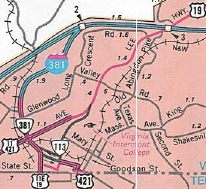 I believe US 19 was multilaned in 1966 when it was put on Commonwealth and Euclid Ave east to near VA 113. 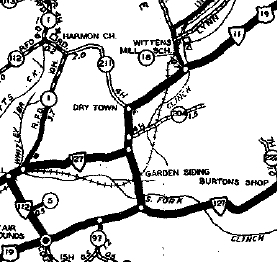 In 1968, US 19 was multilaned from Abingdon to Holston; about Springville to Bluefield WCL. In 1978, US 19 was multilaned from 5 miles west of VA 80 Eb to 2 miles past VA 80 WB. In 1995 or 1996, US 19 was widened from the Russell/Tazewell Line to Claypool Hill. In 1997 or 1998, US 19 was widened on the Lebanon bypass. In 2002, US 19 was multilaned from the Lebanon Bypass to 5 miles from VA 80; 2 miles east of VA 80 to Tazewell County. Truck Route: A Truck US 19 exists in Bristol, running between US 19/US 421/VA 381 using Goode St, Cumberland St, Randall St and Moore St back to US 11-19 at the now unposted northeast end of VA 113. Comments: US 19 is a decent (albeit longer) alternative (with US 460) to I-81 between Abingdon and Christiansburg. Seems to me since US 19 is a throguh route, it should be added to I-81 via VA 381/I-381 and replace VA 140 in Abingdon. US 19 could also be added to the US 460 routing around Bluefield VA/WV as the two routes meet again in Princeton WV. Creation: US 19 Business for Tazewell appeared in 1974 when US 19-460 was placed on new freeway north of town. Posted: Fully posted; numerous cutouts remain within Tazewell proper as of 2008. Comment: US 19 Business follows much of the original VA 11 through Tazewell. Creation: US 19 Business for Lebanon appeared in 1985 when US 19 was placed on new freeway south of town. Comment: US 19 Business follows original VA 11 only east of VA 82. Previous US 19 ALT's: US 19 ALT: Appeared in CTB minutes in 1947 as construction for the bypass of Abingdon, which was an upgrade to SR 670. It appears this became mainline US 19 in Aug 1951 (CTB). I have not seen a map actually show US 19 ALT. 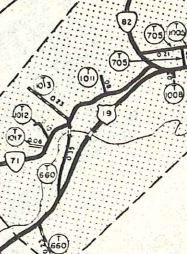 Maps from 1944 and later do not really show the US 19 bypass.